If comedy is art, Central Intelligence wants to make sure the canvas is well covered—it’s got a big, tall brush, a short, little brush and some very funny painters. 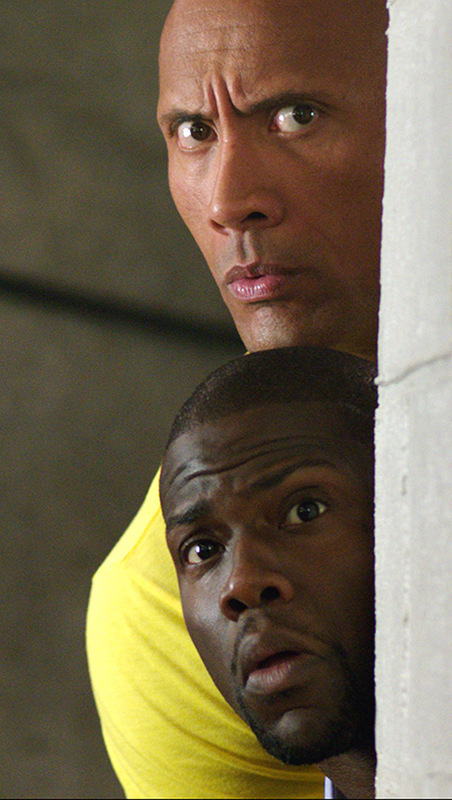 Dwayne Johnson is Bob Stone, a formerly chubby, friendless high-school loser mercilessly bullied by his classmates and shown kindness by no one—except the school’s star football player, student council president and all-around over-achiever, Calvin “the Golden Jet” Joyner (Kevin Hart). A cruel practical joke during a pep rally becomes a distant memory as the year pass. Joyner marries his high-school sweetheart (Danielle Nicolet) and settles into a dull job at an accounting firm, fretting that he peaked in 1996 and that his life is going nowhere. Stone, on the other hand, sheds his adolescent flubber, packs on the muscle and becomes a CIA agent—on a dangerous, rogue, off-the-grid mission. When the two reconnect on Facebook, out of the blue, their reunion creates a spontaneous combustion of hilarity as Stone pulls Joyner onto a wild ride of slam-bang shoot-outs, dizzying double crosses and daring escapes in a race to track down a notorious international trader and stolen encrypted computer codes. Very quickly, Joyner doesn’t feel like his life is a dead end anymore—even though he may not like where it’s taking him! Writer-director Rawson Marshall Thurber knows a thing or two about comedy, as he demonstrated in Dodgeball and We’re The Millers. His fellow writers, Ike Barinholtz and David Stassen, honed their funny bones on television’s The Mindy Project and Madtv, and the script zips, zaps and zings with smart, sharp quips, clever set-ups and solidly crafted gags that often get extra bonus mileage when they pop up for a second—or third—laugh line. Johnson and Hart make quite a pair, starting with the yin and yang of their odd-couple appearance. The former pro wrestler known as The Rock towers over his co-star by more than a foot, and they both find the hysterics as well as the humanity and the heart in their roles, and in the film’s anti-bullying subplot. The movie has some riotously funny scenes, like the one in which Joyner and his wife go to marital counseling, and another involving a stolen airplane, a picnic cooler and a hilarious spiel about an organ transplant. Sprinkled around, like movie candy, are wily Hollywood meta-references and nods to other films. Stone thinks Joyner looks like “a snack-size Denzel.” Joyner tells Stone, whose attire of baby-blue unicorn tees and a fanny pack belies his lethal skills, that he’s a “Jason Borne in jorts.” There’s a great running Breakfast Club gag, riffs on Roadhouse and Jake Gyllenhaal, and a sly Goodfellas line. And I won’t spoil things by revealing the pair of big-name stars in super-secret cameos. You’ll be pleasantly surprised—in vastly different ways—by both. 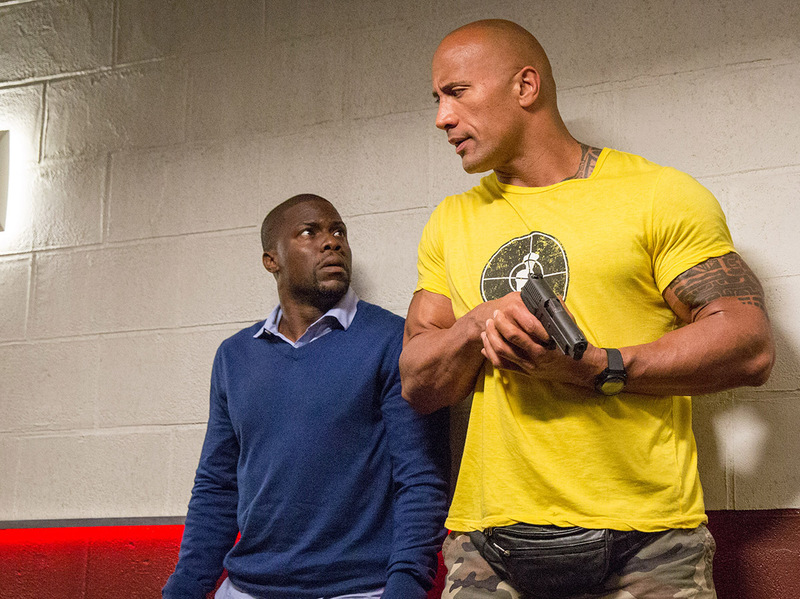 But the real reason to see Central Intelligence: Two very funny actors who might not be anywhere near the same size, but who are perfect alignment for this hilarious spy-spoof assignment.